In their 2015 report Socialising your CEO: From Marginal to Mainstream, PR company Weber Shandwick found that eight in 10 CEOs (80%) are now engaged online and via social media, compared with just 36% in 2010. As more CEOs join the Twittersphere, it’s vital to learn how to best use the platform to make a splash and blow the competition out of the water. Whether you're already in the know or just starting out, here’s our list of the top 7 ways CEOs can use Twitter for branding and engagement, complete with examples from some of the best tweeting CEOs to show you how it’s done. 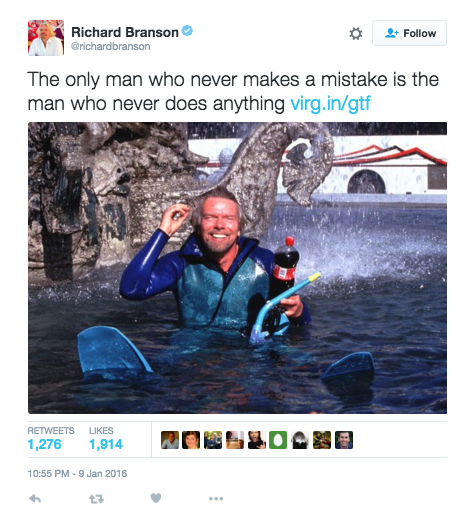 No list of exemplary CEOs on Twitter would be complete without paying homage to Virgin boss Richard Branson (@richardbranson). The rest of this post highlights CEOs of public sector organisations and small- to medium-sized businesses, but when it comes to being a thought leader, Branson is the one to watch. By writing and tweeting his own motivational blog posts on entrepreneurship and success, Richard demonstrates his wisdom and knowledge in his field of expertise and the world listens. Be a thought leader in your industry, sharing what you know to add value to others following in your footsteps. Tweeting informative links and snippets of information keeps your followers updated, provides value and, with relevant hashtags, reaches your target audience. 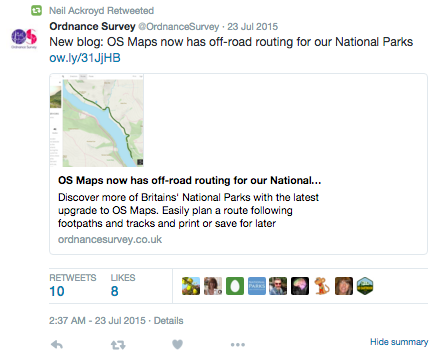 For best practice tweeting, aim to be straight to the point, relevant (read: timely) and either useful or entertaining (or, optimally, both) to your followers. The potential audience for a company and its CEO spans current and future customers, current and future employees, investors, suppliers, partners, media, other influencers and the general public. Because fresh or updated products or services are relevant to your company and wider industry, as a CEO you should always tweet about a new launch. Follow relevant people within your industry, such as journalists, executives and other influencers such as bloggers and thought leaders. Engage with their tweets by retweeting content that interests you and replying when you feel you can add insight or want to ask a question. You’ll find that in turn, more people will find you, follow you and engage with your tweets, as long as what you share tends to be interesting, entertaining or thought-provoking. 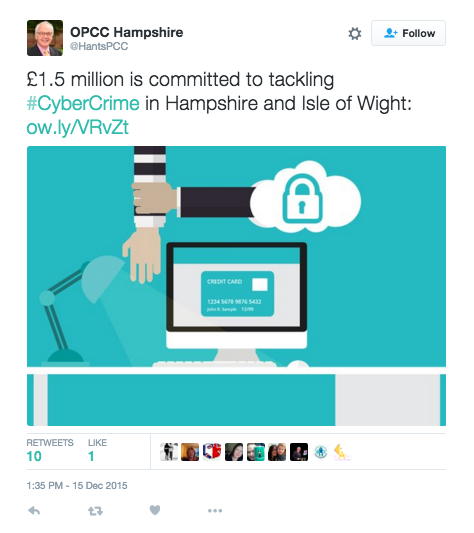 Twitter is a great way of keeping your finger on the pulse, and helping others to do the same. 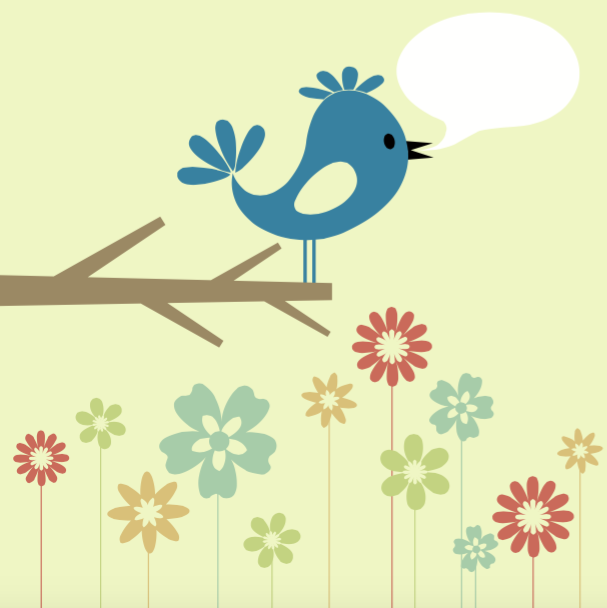 Whether they’re from prospects, customers, employees or partners, reply to tweets directed at you. Your stakeholders will appreciate your attention to detail and they will feel as though you care. There are few things more important than that in the world of customer or client services, and it will go a long way with others too. Keep up the communication; it’s what Twitter is for, after all. 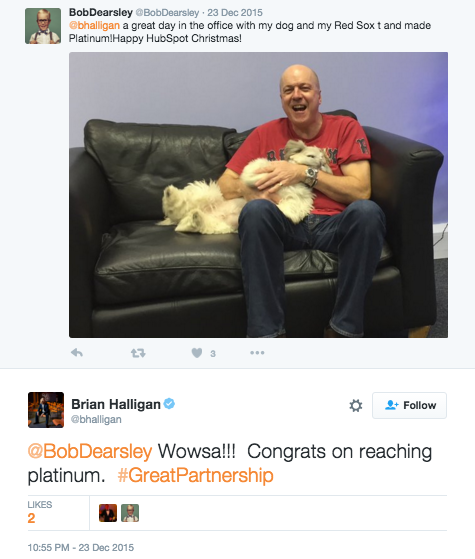 By way of example, HubSpot CEO Brian Halligan (@bhalligan) replies to this Platinum partner, showing how excited he is at the news, extends his congratulations and expressing his gratitude for their continued partnership. 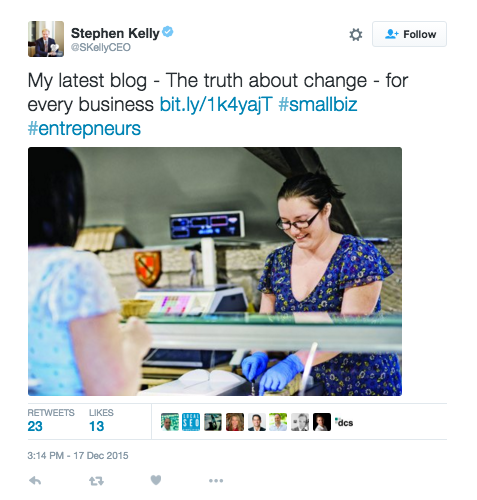 Stephen Kelly, CEO of The Sage Group plc (@SKellyCEO), does a great job of this. He tweets mainly about small business news and entrepreneurship, sharing relevant content (his own and that of others), news and details of events. He also tweets company news and achievements, as well as retweeting his employees’ photos, when they relate to work. By doing so, he promotes the organisation to his intended audiences, provides valuable content and demonstrates the positive company culture. If you only remember one best practice, let it be this: be yourself. Just go for it. After all, you’re CEO because you’re good at what you do. If you need a leg up, ask your marketing team for some guidance. Otherwise, use our tips and apply your own knowledge to Twitter and you’ll be poised and ready to influence the world.